I met Tommie Smith on Saturday during the tenth annual 2013 Tommie Smith Youth Track Meet. 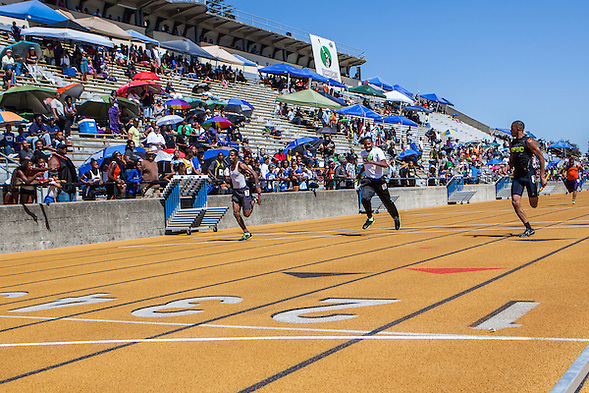 The two day meet occurred at Edwards Stadium on the University of California campus. 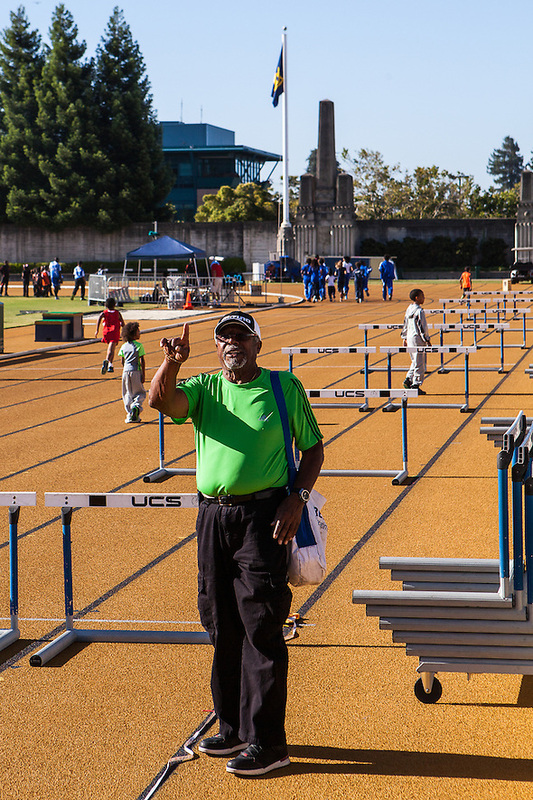 I meet interesting people almost every day, and I met many interesting people during the track season, but Tommie Smith is an international hero who I have known about since I was a kid growing up in the San Joaquin Valley. Besides being an Olympic Gold Medalist and former world record holder, Tommie Smith is a civil rights icon. He is a role model. 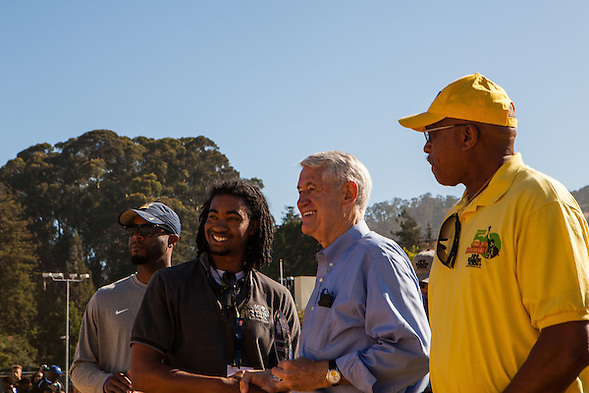 I was so excited, I unintentionally ignored UC Berkeley Chancellor Robert Birgeneau. Chancellor Birgeneau seemed excited too. There is only one Tommie Smith. Many of the teams are coached by former college athletes. On the second day, coaches and parents race each other. 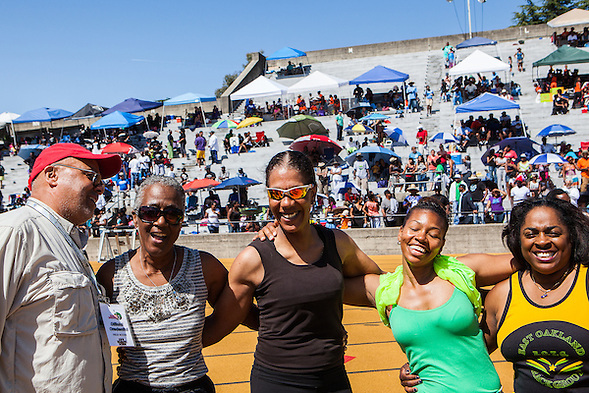 Except for meeting Tommie Smith, watching the adults compete was my favorite part of the two day meet. 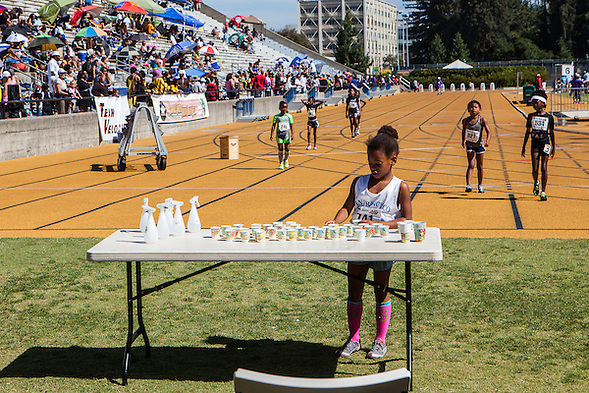 The young athletes learn a great deal from competing. They learn discipline and cooperation. Coaches emphasize healthy choices and positive behavior. Teams also learn the ritual of track. At the beginning of the meet, the teams walked into the stadium together. 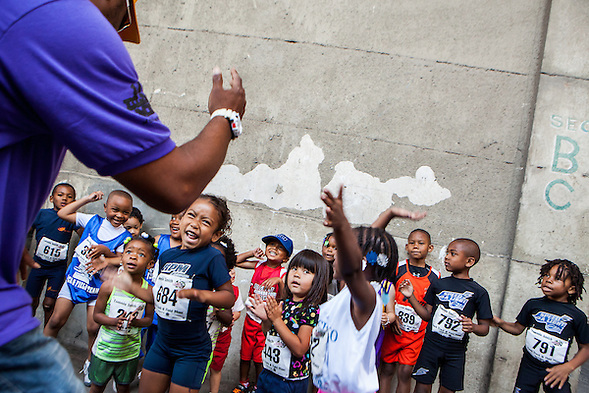 Coach Joe, who introduced our children to track, teaches younger athletes the ritual of preparing for a race. At Edwards Stadium, the athletes have checked in for their race and they are waiting to walk up the stairs to the track. 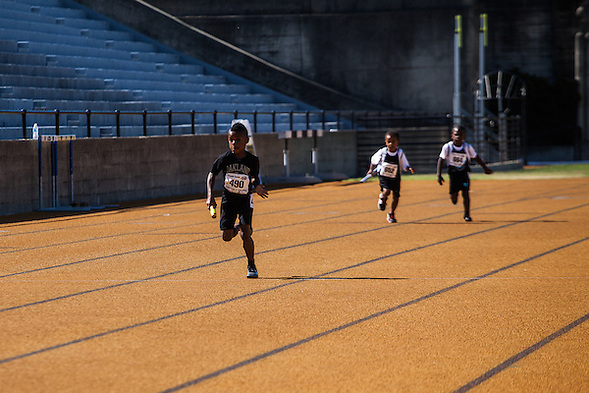 Track also teaches confidence. 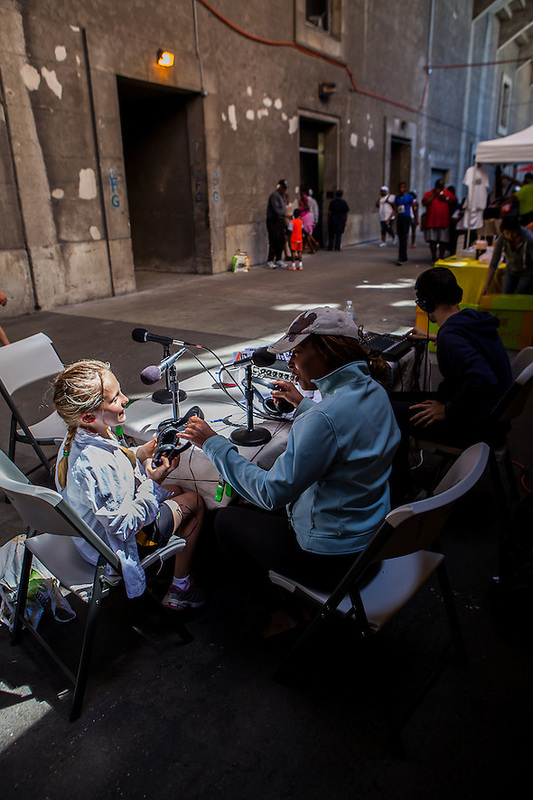 My daughter enjoyed being interviewed. Two hours earlier she feared running. Each time she competes, she finds her voice. My favorite shirt from the weekend had two large words followed by small print. The large words were “Have Faith.” In smaller print were the words, “Hard Work Beats Talent.” Athletes, much like role models, need faith. They need hard work. Athletes learn how to replenish their bodies. Role models need to learn how to replenish their spirits. By starting at an early age, these young people have a better chance at succeeding when they are older. Lastly, track is about community. Somehow, my children have become lucky and joined this community. 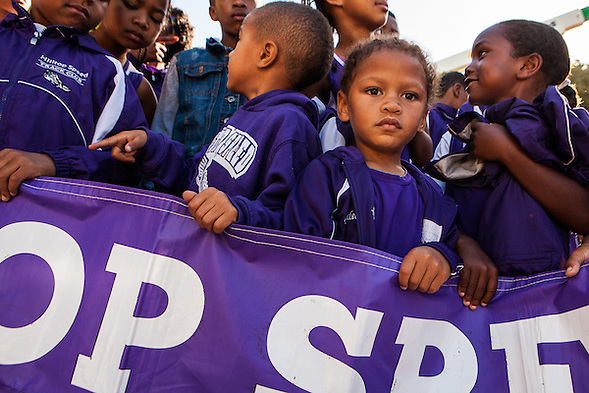 I wonder what lessons they will learn from their coaches, fellow athletes and Tommie Smith. This entry was posted on Monday, June 3rd, 2013 at 10:30 am. It is filed under Journalism and News and tagged with 100 Black Men, Tommie Smith, University of California Berkeley, Youth Track. You can follow any responses to this entry through the RSS 2.0 feed.